Cairo is a handsome but very shy fellow. He was rescued as an adult & had an upper respiratory infection upon arriving at CRFR. He didn't have much of an appetite & it was hard to ensure he was getting his medicine. After resting up in a large crate, Cairo got over his cold & joined the CR!FR tribe. 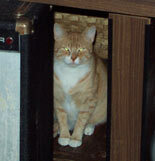 He didn't adjust well initially & went long periods without even popping his head out of hiding to see what was up. Turns out he had a secret hiding place in the rafters & would only come down when no humans were around. We sealed off Cairo's hiding place, forcing him to adjust to the CR!FR environment. Eventually, he'd let himself be seen for a brief moment. Now he feels relaxed enough to remain on the cat cot when he's napping but he'll hide if he feels uneasy. Cairo has a ways to go but whether he gets there or not doesn't matter. He's safe, warm, dry, well-fed & with many family members from his original colony. Hopefully he's happy, too. I'm sad to report that beautiful Cairo passed away at the vet today. He had a very large tumor on his right hind leg. The vet said taking the leg off wouldn't be advisable because it was so big. Plus he had other health issues, including retinal degeneration. Cairo never got to the point that he'd tolerate close human proximity. We didn't know about the tumor it until it was quite big. 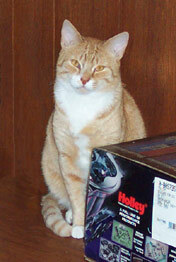 Cairo was a mellow cat who generally kept to himself. He hid out of sight for the better part of his 1st year here. After he relaxed a little, he was usually seen sleeping, curled up on the futon in the feral lounge with his buddies, or scurrying off to a hiding place. His time with us was short but at least Cairo had 3 years of comfort & warmth, good food & the company of his colony. I wish I had more photos of him, he was always very shy. See you on the other side, Cairo. Say Hi to Li'l Bette for us. We miss you both.